According to contemporary accounts, Roger de Mowbray	died in Palestine shortly after his capture there in 1187, and was buried at Sures. 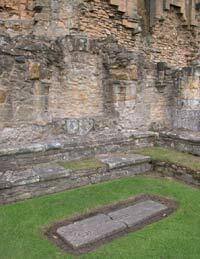 By the late thirteenth century, however, the monks of Byland clearly thought that his grave was in their chapter-house. Moreover, a sixteenth-century narrative from Roger’s Augustinian foundation at Newburgh describes how he had actually returned to live in England for some fifteen years and was then buried in the chapter-house at Byland Abbey. Indeed, following their visitation of the religious houses in the North of England, in 1535, the royal commissioners, Doctors Layton and Legh, remarked that the sepulchre of Roger and his wife lay in Byland’s chapter-house. The colourful account of Roger’s supposed return journey from the Holy Land, described in a sixteenth-century narrative from Newburgh Priory, tells of adventure, fantasy and daring. According to this version of events, Roger wrestled with a dragon and encountered a lion, which he brought back with him to his castle at Hood, in Yorkshire. His exploits are remarkably similar to those of the Arthurian hero, Yvain, in Chrétien de Troyes’ twelfth-century romance, ‘The knight and the lion’. A search for Roger’s grave in the nineteenth century resulted in the recovery of a tomb slab that was thought to be his but was more than likely from the grave of a former abbot of Byland, since it bore a mitre, rather than a sword. A slab incised with a sword found in the cloister in the 1920s is also unlikely to have belonged to Roger and was probably one of the graves flung out from the church during the spoliation of the abbey in the sixteenth century.